Today is the day on which I will not go within ten miles of the nearest mall or department store, namely, Black Friday. Or, as a friend of mine puts it, "The day we fight our neighbors and friends to get more stuff, immediately after we gave thanks for what we already have." Please understand that I mean no disrespect to people who love shopping. Everyone has their hobbies, and I wouldn't expect others necessarily to participate, or even understand, mine. Take birdwatching, for example. I'm the guy who zoomed out of the door at just before 8 AM, drove almost 30 miles, and stood on the lake shore in the freezing wind clutching my binoculars, because there'd been a report of a King Eider (a rare species of duck) at Myer's Point on Cayuga Lake. I and two other equally insane birdwatchers shivered in the cold for a half hour, scanning all of the hundreds of ducks bobbing out there in the lake, and finally, after all that work and discomfort... we didn't see the bird. And, oddly, none of us felt like we'd wasted our time. "Ha ha, these things happen, if you're a birdwatcher," was our basic response, and I've no doubt if the King Eider suddenly reappears, all three of us will rush right back without a second thought. So people, in the throes of a pastime, will do some pretty odd things. Add to that the bonus of getting a good deal, money-wise, and you've got a combination that leads people to engage in behavior that under normal circumstances would be grounds for a psychiatric evaluation. The news reports are already beginning to come in... apparently the parking lot of the Toys "R" Us in Nanuet, New York was already full by 10 PM on Thanksgiving night. This means that these people are going to sleep in their cars, or (more likely) stand in line in the cold and dark, to be amongst the first to be able to shop. Myself, I'd choose the King Eider over that in a heartbeat. I might even choose a root canal. What I find the most amusing about this is how we as a society let ourselves be drawn in to media-driven rituals. I'm not even talking about Christmas and Easter and so on, because those were holidays of long standing, with religious significance and replete with traditions, long before the media got involved. I'm more thinking of the ones that the media and corporations either created (e.g. Black Friday) or morphed so drastically from their original versions and purpose that they're virtually unrecognizable (e.g. Halloween). And we allow ourselves to be drawn in. We dress our kids up as Batman, Superman, the Little Mermaid, and so forth, with the traditional plastic masks with poorly-lined-up eyeholes, on October 31 because that's what the media says we should do. As an experiment to support this, I challenge you to dress your kid up as, say, Shrek on April 17, and send him out to knock on your neighbors' door and say "Trick or Treat." Odds are, it won't work. Odds also are that your neighbors will begin to wonder if you yourself need to up the dosage on one or more of your prescriptions. But it'd still be an experiment worth running. Once again, I'm not questioning the motives of people who participate in these activities because they think they're fun; I'm more thinking about the folks like myself who actually loathe shopping, but they go out on Black Friday anyhow, because "that's just what you do." For myself, I can't imagine allowing myself to be coerced into shopping. I can barely even tolerate grocery shopping -- my idea of the proper technique for grocery shopping is to zoom down the aisles at 45 miles per hour, knocking over small children and little old ladies, while hurling various grocery items into the cart after barely looking at them to check and see if it's what I actually wanted to purchase. Every once in a while this will mean that I buy something I really didn't intend to. "Gerber Mashed Carrots?" Carol will ask, while putting away groceries. "Our kids are 27 and 29 years old. And you hate carrots." But I consider this a small price to pay, if it allows me to beat my previous record time for completing my shopping list. 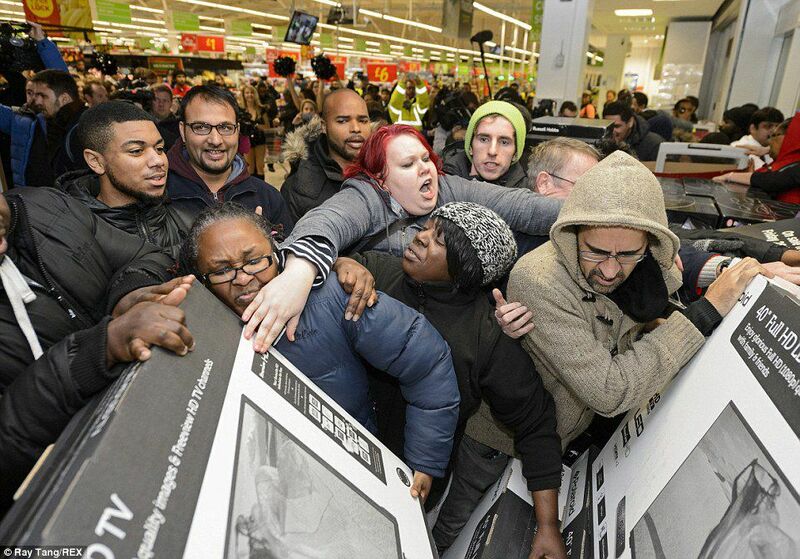 In any case, if you love shopping and deals and Black Friday, I hope you enjoy yourself. Me, I'm sticking close to home today. Unless that King Eider comes back.